It is said that the most English tradition of all was born in the first half of the nineteenth century in the chambers of Duchess Anna. Bored of her long afternoons spent in the Bedford estates, she asked her chef to prepare a snack to accompany her tea. Yet there’s little doubt that the noblewoman could never have imagined that her afternoon ritual was to become the nation’s favourite custom, the heart of a vast business of our times, and a distinguishing element of British culture. 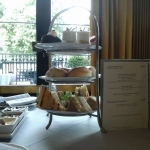 Jack Buchanan’s song was right: there are many English people, still to this day, who never forfeit their afternoon tea. 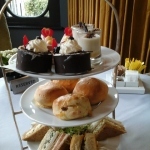 But today I want to talk about a different kind of Afternoon Tea, an Afternoon tea that tells you of old England, respecting its tradition, while enhancing it with the special touch of five-star experts, a special touch of Italian flair. 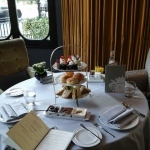 If you happen to be in London and want to give yourself a special treat, if you want to take the opportunity to learn a little more about the traditions of your host country, there is a place where you have to go and that’s Baglioni Hotel London. 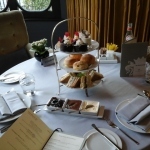 Here, in the beautiful lounge overlooking the Bellavista terrace, just opposite the magnificent Kensington Gardens, you can try one of the finest Afternoon teas that I have personally ever tasted in the United Kingdom. It was here that an afternoon spent in the company of a friend became an unforgettable union of flavours. Sitting at one of the comfortable tables in the Brunello Lounge & Restaurant, it was by no means easy to choose between the teas on offer on the menu, but as a lover of mixed berries, I eventually opted for Granny’s Garden, an infusion of red fruits and Bourbon Vanilla with an embracing flavour, while my friend chose a Superior Oolong, a refreshing black tea. 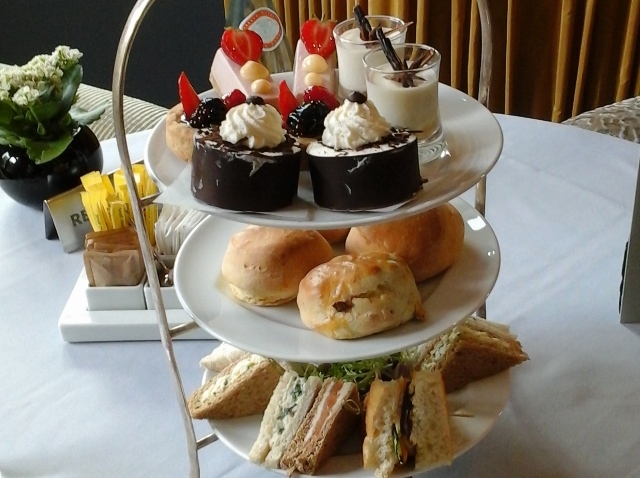 Yet the feast for the eyes and the palate was soon to arrive on a typical multi-tiered tray. Offering both sweet and savoury for those of you with a demanding palate, chef Claudio Milani embraces the challenge of giving you a surprise. 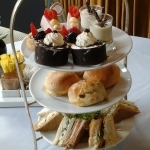 Starting with a trio of appetising sandwiches in traditional English style, with the highly popular salmon and cream cheese; the homemade focaccia with grilled vegetables recalling the flavours of Puglia not only adds a touch of Italian class, but enhances this traditional ritual without overpowering it. As an Italian living in London, I have to admit that the flavours from my home country together with those of my host country have never seemed such a winning combination. 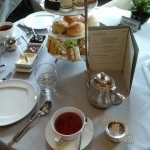 While enjoying my tea, I could not resist tasting some typical scones. Homemade by the skilled hands of the Brunello Restaurant kitchen crew, these fragrant traditional treats came together with luxurious creams. 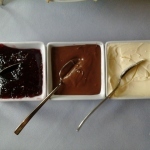 Of course, this also couldn’t do without an Italian touch, offering nutella, the most loved spread in the world, finely displayed on a tray along with strawberry jam and clotted cream (with a buttery consistency matching that of the original Devonshire version). 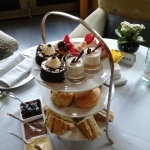 Although we were already full to the brim at this point, we certainly couldn’t resist indulging in the top tier of that inviting tray which was still to tantalise our taste buds. It was an opportunity we simply couldn’t pass up! 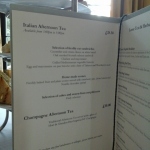 That’s right, everything stops for tea, as Jack Buchanan rightly sang. 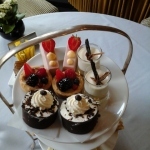 So, if you are in London and want to taste an exceptional traditional Afternoon Tea with a five-star Italian touch, do stop by for a cup or two. You already know where to go. Born and raised in Italy, she worked for several years as a journalist in Rome until 2010, when she left the land of her ancestors to move to London. This is where she began blogging in her mission to tell the Italian community who live like her on the banks of the Thames, about the charms this city offers and LondrachiamaItalia was born. Taking the Belpaese with her in her heart, she began to look for a little piece of it in London and this is how, in her various contributions as a freelancer, she is able to discover the most beautiful parts of Italy hidden in the corners of London. You can find her on Twitter and Facebook. 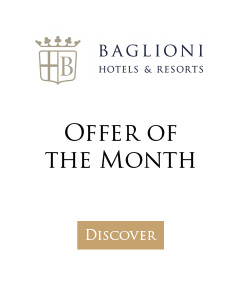 Concierge tip: If you’re planning a trip to London with your family, don’t miss out on the 5 star comforts of Baglioni Hotel London. The new family package at the hotel includes special amenities to entertain both young and old, including a free DVD selection, unlimited use of Nintendo WII or Playstation, tickets to the London Eye and many other family activities.